Saint Nicholas (Svatý Mikuláš) in Czech Republic, as well as in other Christian countries, is a popular fest day. It celebrates figure of Saint Nicholas of Myra, who was born in 280-286 in the city of Patara in Asia Minor province. Later he became a bishop, who was very popular among people for his generosity, charity and justice. During his life he took care of orphans, widows and other persecuted people. Nicholas of Myra died probably on 6th of December between 345-352. On this day people celebrates the Day of St. Nicholas. 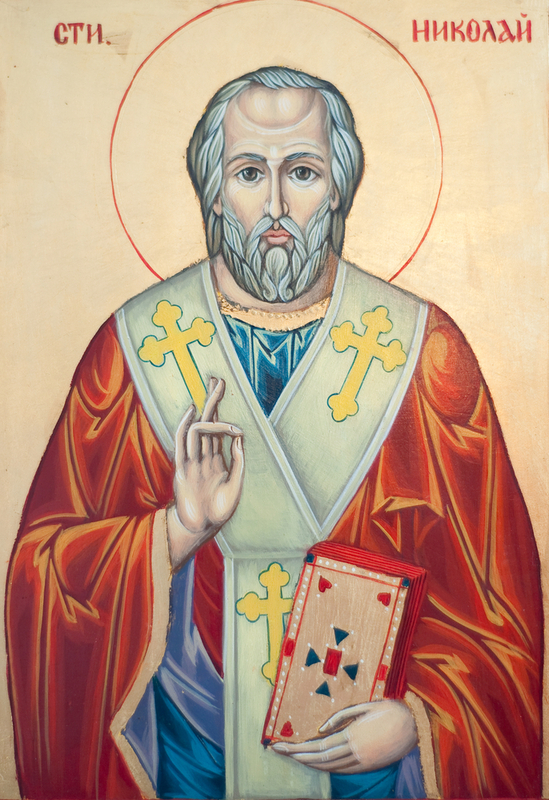 St. Nicholas is patron of merchants, archers, lawyers, pharmacists and students. He’s also the protector of bridges against floods and helps in need. He’s patron of wedding and happy marriage and protector of children against sickness. 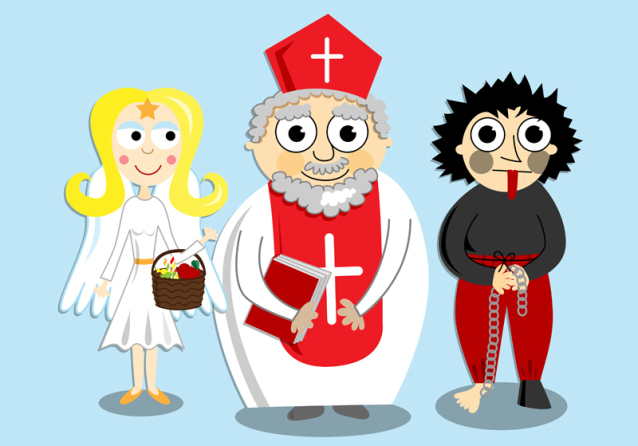 Cult of St. Nicholas began to spread about 2 centuries after his death. He was popular in Greek Church and later in Slavic countries. Traditions linked with Nicholas are very diverse and regionally and nationally different. Part of most of them is giving gifts to children. In Scandinavia he lets gifts in shoes, which kids place near fireplaces. In Croatia Nicholas is accompanied by devil Krampus. In Germany he walks with groom Ruprecht and in Russia it’s Ded Moroz and Snegurochka. In Holland he’s called Sinte Klaas and in UK and USA Santa Claus, who brings presents at Christmas. In Czech Rep. so called “Mikulášská nadílka” (Nicholas’s presents) is celebrated. According to old folklore Nicholas came from sky to ground every year on 5th of December and together with devil and angel he came around houses and gave kids sweets or coal and potatoes depending on kid behaviour. Part of traditions were Nicholas’s markets, which took place on many places. Merchants sold bakery, marzipan, gingerbread, chocolate and little toys. Popular were little figurines of devils made from dried plums (prunes) and so called “světy”, a big apple standing on three wooden sticks decorated with dried fruits. Bakers made beautiful products, the most common were Nicholas, angel and devil. And a gingerbread alphabet, which helped kids learn and after they could enjoy eating. In many regions, parades took place. In masquerades were several Nicholas, who were accompanied by devils and angels, but also hussars, dragoons and hajduks. One of the largest parade used to be near Litomysl to the end of 19th century. Visits of St. Nicholas were regionally different. In poor regions, kids hanged stockings on windows or doors over night and found gifts in the morning. In richer regions Nicholas came to children in person. He was a tall figure with long white beard. He wore long white shirt with red-white cloak quilted with golden thread. He had red or white bishop’s hat with golden cross in the front. In one hand he held a long crutch and in second hand he held a bag with gifts. Devil his companion should scare bad kids. Nicholas asked parents about children’s behaviour and then he tested kid if it can pray. If he was satisfied, he gave kids fruits, nuts and some sweets. But if he wasn’t devil gave the poor kid some coal and potatoes. But really naughty kids were threaten to be thrown into sack and drag in hell. This traditional conception of this fest persists to this day, mainly in the countryside. But even there changes applied. Kids are not tested from praying anymore, but they are to told some poems and rhymes and songs. Fruits and nuts were replaced by bars and chocolates. But a little of coal and potatoes is still a threat.